The mastermind behind Wixstars' online casino is Brightnet, a gaming company operating in Romania as part of the Aspire Global Group. Players needn’t worry about the safety of the casino as it has obtained licenses from two of the most reliable gambling commissions in the world: the UK Gambling Commission and the Malta Gambling Commission. The operator has created a user-friendly and easy-to-use platform for easy access from desktop or mobile devices. To keep the crowd interested, Wixstars pampers its players with a wide range of games, a generous welcome bonus, promotions and a VIP club for extra rewards. To provide a comprehensive and versatile range of games, the operator has partnered up with the industry's best game developers. In the casino lobby you will find the best and newest games from software providers like NetEnt, Microgaming, Play’n Go, Evolution Gaming and Elk Studios. However, nowadays it’s not enough to just offer a big collection of high quality games. The provider has to make sure the games are accessible at all times. Thankfully, Wixstars has succeeded in this with a games lobby that’s easily accessible and navigable from any device, including a laptop, a phone, or a tablet. Visit Wixstars Casino from wherever you are. 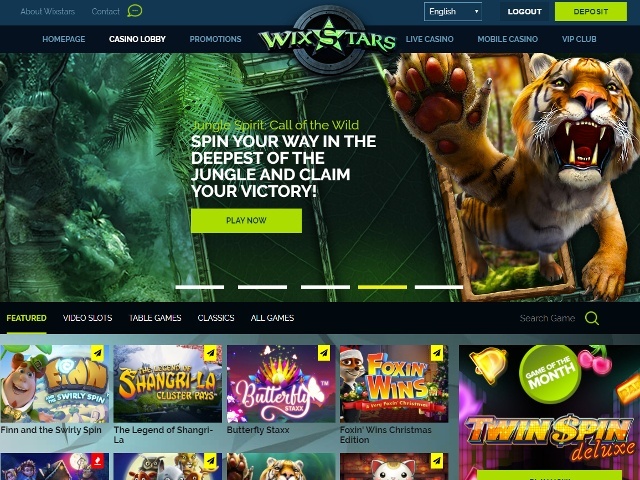 The Wixstars design team has managed to create a stable but slick online casino. The casino's colour scheme and theme catch your eye, without giving you a headache after a longer period of time. The user interface decreases comfortably depending on the size of the screen, so all the information you need is at your fingertips, whether you're playing on desktop or on the go. The games lobby is filled with all sorts of slot games and table games. There are five categories to filter your search: featured, video slots, table games, classics and all games. These categories are rather broad, seeing Wixstars has hundreds of slots in its lobby, but if you know what you’re looking for, you can use the search function to find your game. Please note that when logged in, you can find more categories to facilitate your search, including different types of slots, scratch cards and instant games. In addition to slots and table games, there’s also a link to the live casino or the mobile casino at the top of the screen. From the top navigator you can also access the promotions page and the VIP club to find out more about how Wixstars Casino rewards its loyal customers. Finally, you can find all the practical information at the bottom of the screen, including FAQ, terms and conditions, privacy policies and contact information. 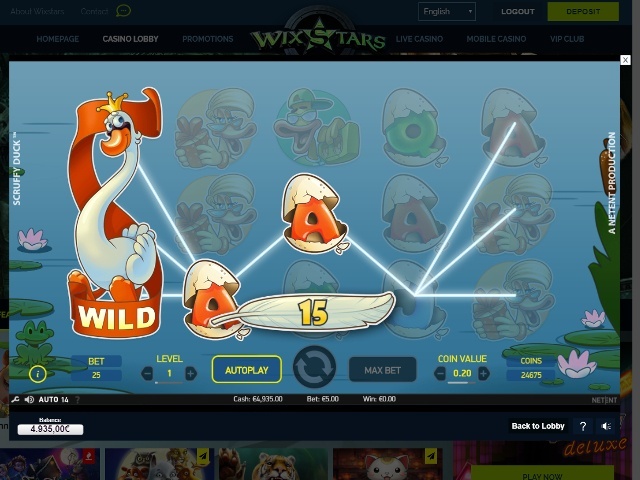 By partnering with some of the industry’s best software developers, Wixstars is able to offer a wide range of slot games that will satisfy almost everyone’s needs. There are nearly 200 slot machines on the site. Slots fans will recognise all the big titles from NetEnt and Microgaming, but there are also many new games to be discovered. Does Wixstars Offer Progressive Jackpot Slots? On the home page there is a big banner with a seven-figure number on it representing the total amount of the jackpots that are currently offered on the site. Click on the button below to log in and to get in on the action. When you’re logged in, you can easily access the jackpot games by clicking the ‘jackpots’ button in the slots section. Wixstars offers two progressive jackpots: Divine Fortune and Cosmic Fortune. 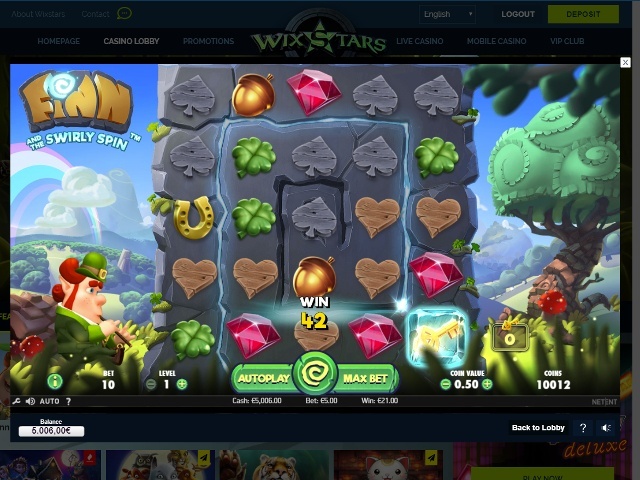 Can Players Demo Wixstars Casino Slot Games for Free? 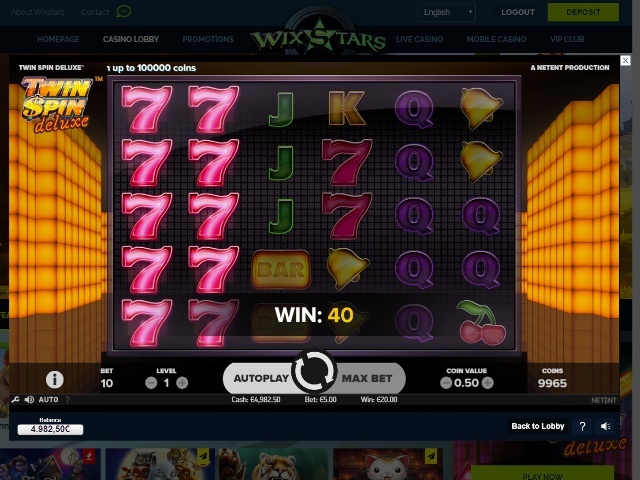 Wixstars is committed to providing entertainment and fun to its visitors and for this reason all of its slot machines (except progressive jackpots) can be played for free. Playing a demo version of a slot game is a great opportunity to find a game that's right for you and to discover all its rules and features. While playing a demo version can be helpful, it’s also a lot of fun! When you hover the mouse over a game, you can choose to play the demo version or to play for real money. You can even try the games before registering with the casino, which can be handy if you’re still trying to decide if Wixstars is the right casino for you. If you are convinced that it is, then you can create an account in just a few minutes and start playing with real money. Wixstars allows you to fund your account using all popular payment methods. You can deposit using VISA and MasterCard or a direct bank transfer if you want something more traditional. It’s also possible to deposit using popular e-wallets, such as Skrill and NETELLER. For players who don’t like to share their personal information, you can also deposit with paysafecard. Deposits start at a minimum of £10 and are processed immediately. Please keep in mind that your withdrawals will be credited onto the same card/account that you’ve used to deposit. It takes 1-2 days for a withdrawal to be processed. Once processed, it takes another 3-5 business days for your money to appear into your account. You can avoid this waiting period by depositing and withdrawing through e-wallets. New players are given a warm welcome at Wixstars. Like many other online casinos, Wixstars generally offers a first deposit bonus including free spins. Bonuses like these are handy to get familiar with the games that are on offer without having to spend your own money. You might wonder what’s on offer for players who decide to stick around? To reward its loyal customers, Wixstars has its own VIP Rewards Club. Players can earn Reward Points by playing their favourite games. These points are redeemable for Bonus Money. The more Reward Points you have collected, the higher your loyalty level will be. There are six loyalty levels in total, each rewarding you with bigger and better rewards. Wixstars has obtained licenses from the UK Gambling Commission and the Malta Gaming Commission, which means that it complies to strict security and safety demands. Players can rest assured that all games are fair and the results are random. In addition, Wixstars also uses the latest 128-bit encryption technology to ensure that all your personal information is kept safe. Should you have any problems or questions, the Wixstars customer service team is easily accessible via live chat, which is available every day of the week from 09:00 to 02:00. If your question is not urgent, you can also choose to email the support team. If you prefer a more personal touch, you can contact Wixstars by phone as well.